Arcanum junior Kayla O’Daniel scores a basket during the third quarter of a Cross County Conference game at Newton on Thursday. 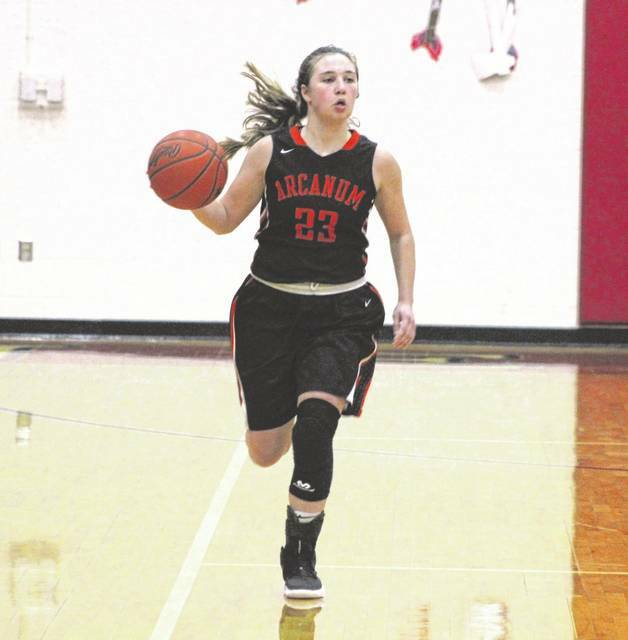 O’Daniel was one of five Arcanum players to score in double figures leading the way with 14 points as the Lady Trojans defeated the Indians, 76-49. Arcanum freshman Madelyn Fearon scores against a pair of Newton defenders in a Cross County Conference game on Thursday. 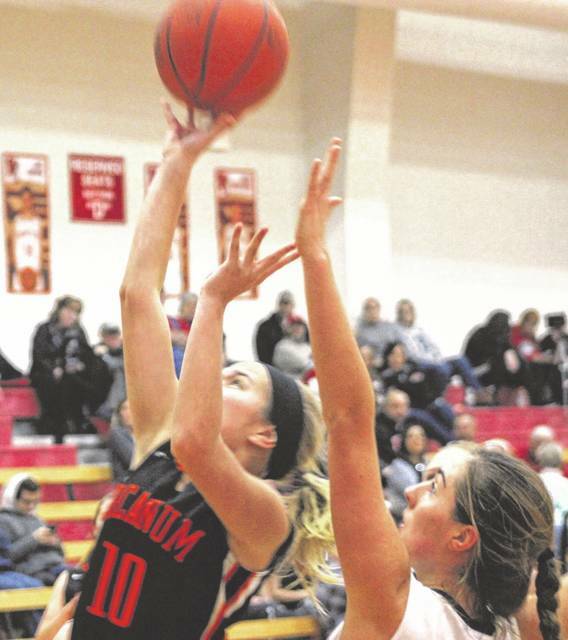 Fearon was one of five Arcanum players to score in double figures as she finished with 13 points. The Lady Trojans defeated the Indians, 76-49. Arcanum’s Sydney Artz scores with a Newton defender on her back in a Cross County Conference game on Thursday. The Lady Trojans defeated the Indians, 76-49. Arcanum junior Camille Pohl gets a steal and takes it to the basket in a Cross County Conference game at Newton on Thursday. The Lady Trojans defeated the Indians, 76-49. Arcanum’s Eva Siculan tries to finish at the hoop after getting a steal at the other end and driving full court. The Lady Trojans defeated the Indians, 76-49. Arcanum senior Gracie Garno brings the ball up the floor in a Cross County Conference game at Newton on Thursday. 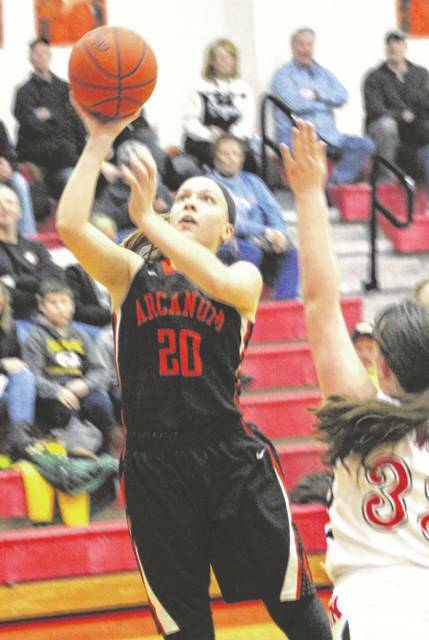 Garno was one of five Arcanum players to score in double figures as she finished with 11 points. The Lady Trojans defeated the Indians, 76-49. 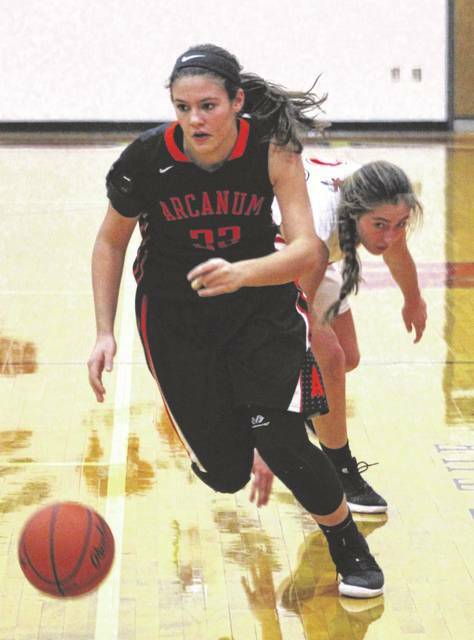 PLEASANT HILL – With two regular season games left on their schedule, the Arcanum Lady Trojans have already surpassed their win total from last year (12) as they currently sit at 14-6 overall after defeating host Newton 76-49 on Thursday. 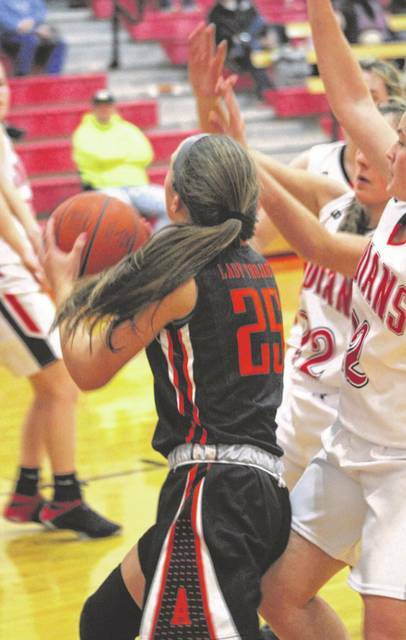 The Lady Trojans exploded for 45 points in the first half – 22 in the first quarter and 23 in the second – while holding the Indians to 26 (13 in each quarter) for their fourth consecutive win. Everyone on the Arcanum bench got playing time and 9 of the 15 girls found the scoreboard led by five players in double figures. Junior Kayla O’Daniel was the high scorer with 14 points. She was followed by freshman Madelyn Fearon with 13, freshman Hailey Unger with 12, freshman Taylor Gray with 11 and senior Gracie Garno with 11. Gray also had 16 rebounds for her 11th double-double of the season, eight of those coming against conference foes. 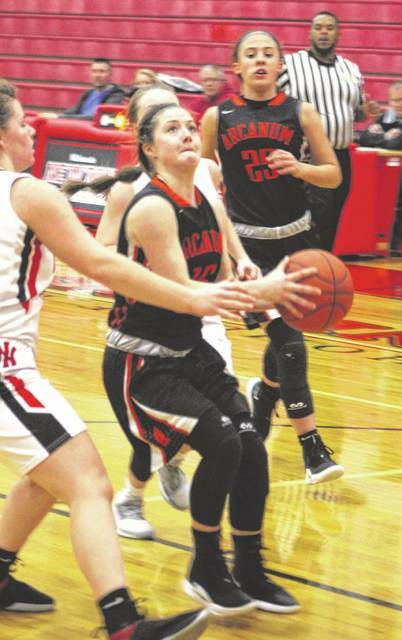 “I’ll tell you what, the past few games these girls have been tremendous and they just keep showing me growth,” first-year Arcanum coach Michael Dean said. “It’s just like when we talked at the beginning of the season that we have to be a family first. You are your sister’s keeper and that’s how we have gone from the very first practice. Newton wasn’t going down so easily, however. Despite trailing 64-35 after three quarters of play, the Indians found opportunities and capitalized on them in the final eight minutes to win the fourth quarter, 14-12. Newton was led by Brooke Deeter with 21 points. Mallory Dunlevy added 8 points and Camryn Gleason and Ally Weaver each had 6 for the Indians. After the five players that scored in double figures, Arcanum got offensive production from Eva Siculan with 6 points, Camille Pohl with 5 points, Macey Hartman with 2 points and Sydney Artz with 2 points. Arcanum will travel to Versailles on Tuesday and then close out the regular season at home against Tri-Village on Thursday. Arcanum – Gracie Garno 5 0 11, Camille Pohl 2 0 5, Madelyn Fearon 4 2 13, Hailey Unger 4 4 12, Kayla O’Daniel 7 0 14, Taylor Gray 5 1 11, Macey Hartman 1 0 2, Eva Siculan 2 1 6, Sydney Artz 1 0 2. Totals: 31 8 76. Newton – Camryn Gleason 2 2 6, Ally Weaver 2 2 6, Jaden Stine 0 2 2, Brooke Deeter 8 0 21, Michaela Kirk 0 4 4, Jessica Mitchell 1 0 2, Mallory Dunlevy 4 0 8. Totals: 17 10 49. 3-pointers – Arcanum 6 (Fearon 3, Garno, Pohl, Siculan), Newton 5 (Deeter 5). Records: Arcanum (14-6, 8-3 CCC), Newton (9-10, 6-5 CCC).